How to Select a Remote Fuel Fill Station for a Diesel Fuel Tank. Many generator set installations utilize some form of above-ground fuel storage tank, whether it be a freestanding tank, or a “sub-base” tank installed within the generator set skid. Due to space, security or other architectural limitations, the architect and design engineer may be forced to locate the fuel storage tank in a location that is less than ideal for fuel filling operations. The “out of the way” location of these tanks can lead to unsafe conditions, especially when fuel delivery personnel deploy as much as 100 feet of fuel hose in order to reach them. Codes and standards for on-site fuel storage combined with demands for safe and visually- aesthetic facilities have led to the use of remote fuel filling stations. A fuel fill station is designed to allow for safe and convenient remote filling of fuel tanks. Fuel fill stations are available in various configurations, generally dependent on the fuel delivery vehicle type, the size of the fuel tank, and its relative location to the fuel delivery point, as well as the amount of time that would be desirable (or allowable) for completion of the fill operation. Here are some guidelines for selection of an adequate fuel fill station for a diesel fuel tank. Fuel Delivery Vehicle Type: Fuel delivery vehicles are generally referred to as either gravity trucks or pumper trucks. A gravity delivery truck has no means to positively discharge fuel when the destination tank is at grade, or above grade, as in the case of a multi-level parking garage. More common, the pumper truck, is equipped for positive fuel delivery via a truck-mounted pump. The flow rate may vary by vehicle, but, given a short distance to the tank, it is generally sufficient to allow the operator to complete the task in a relatively short amount of time. Location of the Fuel Tank: The location of the fuel tank might be the most critical aspect for selection of a fuel fill station. The fuel fill station should be selected so that it can allow reliable delivery of fuel to the tank. Considerations to fuel pressure, fuel line size, head restrictions, etc. are critical. If it is determined that a pumper truck might not able to provide adequate pressure to deliver fuel to the tank, the engineer should consider a fuel fill station that incorporates a pump. 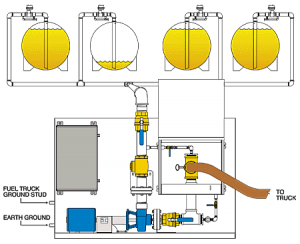 Fuel Capacity of Tank: The size (capacity) of the fuel tank is important when selecting a fill station that incorporates a pump. The flow rate of the pump should be selected to provide reasonable fuel filling times. Application: For fuel offloading from a pumper-type truck. This product provides a wall or floor-mounted Nema 3R cabinet, which houses a quick-disconnect coupling for the delivery truck hose. This fitting is generally available in 2”, 3” or 4”. The enclosure also contains the required valves, spill containment and manually operated hand pump to ensure safe operation. The automatic version of the FuelPort includes a control panel and fuel level sensor that alerts the operator once the tank is reaching a full level. It also closes an electrically-operated valve to prevent overfilling of the tank. A compact version of this product is available to allow for a smaller footprint. Application: For delivery of fuel from a gravity-type truck, or from a pumper truck with inadequate pumping pressure for the specific application. 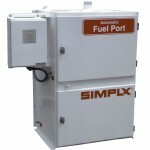 This product provides automated fuel filling operations in a similar package as the Automatic FuelPort. Its key difference is the integration of a motor-driven pump responsible for drawing fuel from the delivery truck and pushing it to the fuel tank. 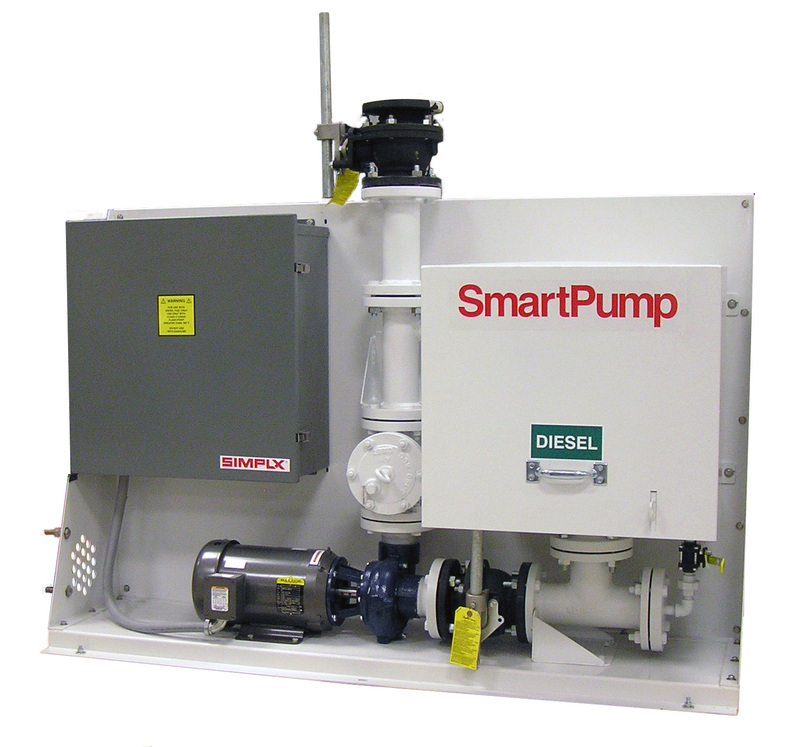 Whether to use a full-size SmartPump, or a Mini SmartPump, depends on the flow rate desired. The full-size SmartPump is capable of flow rates in excess of 100GPM, which make it suitable for large-tank applications. The Mini SmartPump, on the other hand, provides a choice of flow-rates starting at 2GPM to fit most needs. 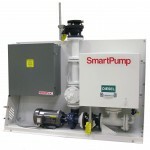 The Mini SmartPump is typically applied with generator sub-base tanks. In a typical installation, a fuel delivery period of 20-25 minutes is common, but the availability of various flow rates allows the engineer to size a system that suits the client’s needs. How to Prevent a Fuel Overflow Condition in a Fuel Day Tank. Can I get the dimensions of the standard and compact automatic fill port? Thank you. Absolutely, see below, and thanks for your visit! I have to do an upgrade of an existing generator. There are 2 diesel day tanks located in the basement and there is no electronic level switches In it. I am planning of proving level switches on those tanks, and providing a new diesel fill line on the ground level. The pipe run is about 100 feet long. The proposed diesel fill line is located outdoor. This project is in Calgary Alberta, Canada. Cab we have a NEMA 4 enclosure c/w stand diesel fill station? What is the suitable model for this application? Thank you for your question Elwind. 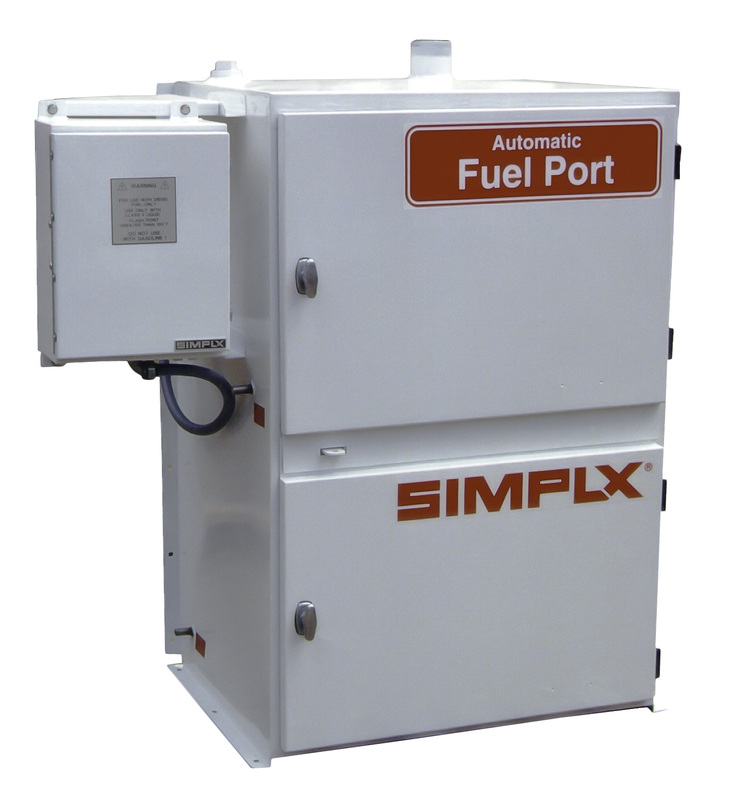 I would suggest a 2-tank “Compact Automatic FuelPort” (fuel fill station,) similar to Simplex’s m/n CAFP-2/2. This would include 2 x level transmitters (one for each day tank) as well as 2 x electrically-operated valves to control fuel fill into only one tank at a time. The normal enclosure for the fuel port is NEMA 3R, but the controller can be specified in NEMA 4 (weatherproof steel) or NEMA 4X (weatherproof stainless steel). You can find more information here. Any thoughts on where to find info on an in-sidewalk fuel filling station pumping to a rooftop diesel generator tank? Not sure I understand the “in-sidewalk” reference, but Simplex makes a flush-mount (thru-wall) version of their Mini SmartPump that may be suitable for your needs. You can reach out to them via: http://simplexdirect.com/Find-Rep.aspx. Thank you but I am looking for a fuel port that goes into the sidewalk not the wall. Sorry, I have no experience with that type of fuel port. Please post back if you find a suitable solution. I need a remote fuel port for an above ground storage tank. All diagrams I see from Simplex show the pipe leaving the Fuel Port and going up, traveling at a high elevation and dropping into the AST. Because of security the fuel port is outside of a fence and is about 80′ away from the AST. Do I need to run the piping high the entire length or can I go underground with the pipe (in double containment piping)? Thanks for the inquiry Mike. Yes, you may run the fill piping below grade between the Fuel Port and the AST. If you would like, you can even specify that the Fuel Port control panel be equipped with an input to accept a “Fill Pipe Leak” sensor, so that you can monitor any failure of the double-containment piping right at the Fuel Port!